Combat Mission: Fortress Italy, from veteran developer Battlefront is one of the many titles in their long line of tactical combat games, and though it has been out for some time now, it continues to receive the occasional patch and engine upgrade. I've been given the chance to review it, and will use this as an opportunity to give my take on Combat Mission as a whole, and of course the contents of this particular title. I will touch on the base game, the Gustav Line expansion, and the Game Engine 4 upgrade. However, much of this review could apply to any of the modern Combat Mission games. First, I have to start off by saying that Combat Mission is probably the one series I've spent more combined hours playing than any other game or series out there. I started with Barbarossa to Berlin, somewhere around 15 years ago. I still remember strolling through a game store at the mall, back when they carried not just PC games, but niche titles like the boxed Special Edition version of CMBB. I pointed it out to my mom as something I had to have, then a couple of weeks later I unwrapped it on Christmas morning. To be completely honest, at the time I didn't really understand what the Eastern Front of WW2 was all about. I was confused as to why there were seemingly endless different nations to play as, but no Americans. That said, the game was just so much fun that I couldn't stop playing, despite having little knowledge of the context for the hundreds of scenarios and campaigns. I set out to learn more about these battles, and in so doing sparked an endless thirst for learning about history, not just war and battles, but also the politics and social changes that led to such massive conflicts. Needless to say Barbarossa to Berlin is in my top five games of all time. Slap a better camera system on it and a little higher resolution and I would probably buy it all over again. Following the initial trio of Combat Mission games (Beyond Overlord and Afrika Korps being the other two), Battlefront developed an entirely new engine which added more detail to the simulation down to the level of each individual soldier, weapon, and bullet being modeled. The first game in that series, Shock Force, had an extremely bumpy start, but eventually shaped up to be another of my all time favorite games. Since then they have released several other games and modules focused on different sections of WW2, as well as the hypothetical Black Sea depicting a full scale Russia vs USA war in modern day Ukraine. Fortress Italy came out somewhere in the middle of that pack, but thanks to the game engine upgrades, it has more or less the same features as the newest titles. So, for those unfamiliar with Combat Mission, what kind of game is it exactly? The series is a highly detailed tactical wargame, which strives to not just crunch the numbers, but to present the combat in a highly visual fashion. The original Combat Mission: Beyond Overlord was leaps and bounds ahead of other wargames of the time, using 3D graphics to bring the battles to life. No more hexes and 2D counters, we could now see the tracers, explosions, smoke, tanks rolling down city streets and infantry charging up hills, all at the same time. The CMx2 engine took all of this to an even greater level of detail, with every individual soldier modeled down to what he can see, how many rounds are in his magazine, and how scared he is. The scale is very realistic, with some maps spanning vast distances and a single large battle taking two or three hours to play out. There is simply a level of detail here which is so much more granular than any other other game I know of. As I'll discuss a bit later though, this level of detail is not without some drawbacks at times. Combat Mission drifts more towards simulation than game, and is best approached with that in mind. If you have never seen the game in action, I've included a gameplay video I recorded here. A picture is worth a thousand words, so a video must be worth a million right? (NOTE: This is a rather low resolution video due to some technical difficulties, the game is much sharper "in person" than it appears here). The game can be played in two distinct ways, either real-time or WEGO. Real time is obvious enough, you hit go and things move. You give orders on the fly and try to pay attention to what is happening across the battlefield. It's possible to pause the game at any time, which is useful for coordinating more complex maneuvers, or dealing with a sudden crisis. WEGO, on the other hand, is a turn-based system. The player gives orders to all of his units, then hits go. The next minute of action is then calculated all at once and plays out like a little movie. You can rewind and watch it multiple times, so you won't miss a single thing. The kicker here is that you have no control at all during that minute. This creates some real tension, since you can't intervene to pull a unit out of an ambush or stop a tank right before it rolls into trouble. Playing in each of these modes really does change how you approach the game. I tend to use real time for smaller battles and WEGO for the monsters. Once a battle hits a certain size, there is just no way to see everything that is going on across different sections of the battlefield. The orders you can give in Combat Mission are much more nuanced than what is usually seen in a strategy game, especially outside the wargaming space. Movement can be done at a variety of speeds including fast (sprint), quick (jog), normal (walking), and slow (crawling). Units can also "hunt", moving forward at a deliberate pace and stopping as soon as a threat appears. Infantry can be given an "assault" order which causes a single infantry squad to automatically break into sections, one leapfrogging the other. Every movement speed has its place, which will take new players some time to figure out. Infantry will get tired rapidly when running or crawling. It's possible to bog down an attack by having your guys exhaust themselves by running too far, leaving them unable advance further until they recover. One part of these games that takes some getting used to are the action spaces. The game world is broken up into hundreds of small squares of terrain. However, the space inside each square is not all treated the same. Where each individual soldier is positioned can make a world of difference. For example, in space along the edge of a shell crater, one soldier might crawl down into the hole, while the other is laying in the open. You can't directly control each individual's exact position, but you can give a facing order which will cause the soldiers to take cover against that direction as best as they can. This system can cause headaches at times though, such as when a heavy machine gun team places the MG in a useless spot with no line-of-sight to the enemy, while one of the crew members is a few feet to the right and has an excellent view. Every unit will engage the enemy on its own (unless ordered otherwise) in a semi-intelligent manner using the "tactical AI" of the game, so you usually don't need to give specific targeting orders. That said, there are many nuanced options for that as well. You can simply mark a specific target, such as a unit, building, or piece of terrain, and your unit will hammer it, or you can give a "Target Light" order which will conserve explosive ammunition. Various targeting arcs can also be set, including an armor only arc so that your AT gun won't be distracted by some infantry in a field when they should be worried about that Panther lurking in the village. I generally don't give that many direct firing orders, since it can take away from the realism of the game. This is because every single unit independently "spots" the enemy, such that if two squads are sitting next to each other, one might spot some enemies in a building and start firing, while the other does not see them at all and so does nothing. It always feels like I'm gaming the system too much if I, as the invisible omnipotent force hovering over the battlefield, direct soldiers to fire at a building because I know something is there even if they don't. Fortunately, communication between units is also simulated, so two units within shouting distance of each other will gradually share spotting information, tipping each other off about various threats. There are also other orders available depending on the type of unit selected. Infantry squads can be sub-divided several ways, such as splitting off a two man scouting team, at anti-tank team, or simply dividing up equally for more flexibility. Notably, the standard Italian riflemen can't be split up like this due their difference in doctrine, something you must work around when commanding them. Many crew served weapons, such as mortars and heavy machine guns, must be ordered to deploy before they can function. This is because deploying/packing these weapons takes a significant amount of time. It's also possible to abandon a weapon entirely if a position is about to be overrun. Units can be ordered to hide, throw smoke (if they have it), set up an ambush, pick up ammo, get into vehicles, and more. Tank commanders can be ordered to stick their head out of the hatch for better visibility, or button up when incoming fire is expected. Thanks the Game Engine 4 upgrade, tanks can also now be ordered to move "hull down" to a given point or target. This will cause the tank to seek out a nearby position from which they can see the target, but the target can only see a fraction of the tank. This is a great quality of life feature, since the player had to eyeball it before and hope for the best. So, I've talked at length about the mechanics, what kind of forces do you get to command in Fortress Italy + Gustav Line, and what sort of battles will you be diving in to? There are four distinct factions at play here. The Americans, the Germans, the Italians, and the Commonwealth. Within these, there are a multitude of historical formations available to play with, equipped with all the weapons they would have actually fielded, on paper anyway. It can be interesting just to poke around and see exactly how, for example, an American armored infantry battalion was set up and how that influenced their strategy. Controlling these various nationalities and formations in battle will force you to adopt very different strategies. The Germans generally have lots of machine guns mixed directly into rifle squads, while the Italians field large squads of simple riflemen, supported by separate crew served weapons. It would take far too long to list out all the different weapons, tanks, and other vehicles are included in the game, but just trust me when I say that if it was there in real life, it's almost certainly in the game. When you go to play a scenario, there are a few different options available: campaigns, one-off battles, and quick battles. Each campaign offers a series of linked scenarios where you use one or more formations to fight through several battles. Depending on the campaign, you may be dealing with limited artillery ammunition spread across multiple missions, or a lack of any replacements for your losses. Other times you may have all the forces and firepower in the world, but find yourself up against some very tough nuts to crack. Unfortunately, there are only three of these in the base game (plus two training campaigns), and four rather short campaigns in Gustav Line. On the plus side, they are very well done and will take you many hours to complete. Next, you can play a standalone scenario. There are many more of these available, plus a few more online if you go looking for user made scenarios. These scenarios range in size from tiny single platoon shoot outs all the way up to battalion sized brawls. While there isn't all that much difference between these battles and the campaign scenarios, the fact that you don't have to worry about using those units again in a future battle means that your strategy could trend towards being overly reckless with the lives of your men. One way scenario designers can mitigate this is by making losses count towards the final scoring of a scenario. Take the objective but lose most of your force in the process, and you could still end up with a defeat. Most of the scenarios can be played from either side, which adds plenty of replayability. These can also be played online against another player, which I'll get to later. Finally, we have the quick battles, one of my biggest letdowns with the modern Combat Mission games. In the original games like Barbarossa to Berlin, this was where I spent 90% of my time, but in the newer games I rarely bother. This is because of a combination of several things: the strategic AI, the lack of random map generation, and the inability of the AI to select units for itself. I'll explain the latter first. In the newer CM games, the forces are organized using a very rigid command structure, and this bleeds over into the counter-intuitive way you select units for a quick battle. Want a couple of platoons of riflemen to make up the core of your force? Sure, just select an entire infantry battalion, then pare it down by deselecting everything except the two platoons you wanted in the first place. Want a section of combat engineers to go with them? Sure, just select an entire battalion of combat engineers...and so on. In the older games, you simply picked what you wanted directly. This is annoying, but not that big of a deal for the human player. However, the AI is not very flexible in this system. It tends to pick large formations at random, with little regard for the terrain or expected mission objectives. It isn't uncommon to see the AI choose an entire company of anti-tank guns or heavy machine guns with no support. Why? Because the formations are organized how they would appear on paper, not how they actually deployed for battle, but the AI isn't programmed to handle this. If you let the AI choose the units for both sides, get ready for five Tiger tanks versus thirty scout cars, and other such nonsensical scenarios. In the older games, you could set the AI to pick a balanced mix of units for both sides, and almost always get a nice force made up of some infantry, a couple tanks, artillery, and various supporting units. It was great because you never knew what you and the enemy were going to get, but you knew it would be fun. It almost never works out like that in the newer games, including Fortress Italy. The other problem is how the "strategic" AI works in the newer CM games. The map maker must draw up plans for the AI to follow, otherwise it won't act at all. For hand made scenarios, this tends to work out okay, since the designer knows exactly what forces are involved and how he wants the battle to play out. It can take a great deal of testing and balancing to get it just right, but the variables are more fixed so it's possible to make a convincing AI opponent. In quick battles, however, the plans are made but the designer has no way of knowing what units will be involved, or how the battle might flow. So what you get is the AI moving units blindly along paths with no regard for whether they are tanks or infantry or a mortar platoon. They also have no regard for the objectives of the battle. In some cases it's entirely possible to avoid an enemy force, let it stroll on by, then go capture the objectives it has passed. The AI will never turn around and come back, it will simply go to the end of its route and wait there patiently until the end of time. In the older games, not only could you have randomly generated maps, but the AI would come running if you took an objective behind their line. That system wasn't perfect, since it could be manipulated as well, but it still felt much more dynamic, as the AI at least responded to what was happening. Okay, I'll get down off my quick battle soap box now. Finally the absolute best way to play Combat Mission: head to head against another player. There are a few ways to do this. You can play hotseat on one computer, if you are so inclined, or online in both RTS and turn-based modes. That said, my experience has been that most play online involves the old-school PBEM (play be email) method. You play a turn, then send the file to your opponent, then they send it back, etc. Playing this way lets you take your time with the really big battles, since your opponent doesn't have to sit around waiting for your move, and one battle can be played out over weeks. You can also easily have many games going at once. While this is perfectly functional, and really the best way to enjoy the game, it's also very dated in its execution. The game file must be manually sent to your opponent and moved to the proper folder before the game is fired up, there is no in-game functionality for this at all. Fortunately, a couple of third party programs can automate this for you, but you'll have to go hunting in the forums to figure it out for yourself, there isn't any official documentation supporting it. (Hint: Search for CM Helper). You'll also have to find opponents via online forums or groups, since there is no means to do so within the game. Anyway, once you are playing multiplayer, it can really be one of the best experiences in wargaming. Gone are the various issues of the AI, to be replaced by a far more cunning and devious human opponent. This is where the game really gets a chance to shine, as both sides use smart tactics and careful maneuvers to feel each other out and strike with a coordinated effort. Quick battles suddenly become excellent again, as you won't know what your opponent is picking for his force, but you know it will be a potent combination and possibly difficult for your own choices to handle. Some friendly ground rules can be handy here, such as an agreement on the general allocation of points between infantry, tanks, artillery, and support. Regardless, you won't know exactly what you are facing until the shooting begins, which creates a good deal of tension. You can also play the various handmade scenarios against a human opponent. Many of these scenarios are already designed to be challenging against the AI, so having a real human opponent can make them doubly so. The sound and graphics in Fortress Italy are quite good compared to the average wargame, but definitely showing age compared to 3D games in general. Improvements have been made, but the visuals are still roughly the same as found in Shock Force, which came out a decade ago. I don't really mind that myself, since what the game is portraying remains very impressive. Hundreds of individually modeled soldiers running around on a realistically scaled battlefield, that is a feat to begin with. My one gripe is that performance continues to be an issue. There is simply a cap to what the engine can do smoothly, regardless of your PC hardware. On the plus side, the vehicle models and textures continue to be outstanding, down to the last rivet. Fortress Italy features some interesting camouflage patterns for many of the vehicles, which are historically accurate as far as I can tell, and add some nice flavor to things. Sound is an area where Fortress Italy, like the other games in the series, is rather bland. Luckily, there are more than a few mods that one can freely download to give the gunshots and explosions a lot more punch. The game also includes a powerful scenario editor for those who wish to build their own maps and scenarios. Unfortunately, due to the extreme time commitment involved to make quality maps in the newer CM games, there are only a few users out there with the time and ambition to do so. Since Fortress Italy is not the most popular game in the series, it has seen relatively few new scenarios made this way. Okay, so this review has rambled along for long enough. What is the verdict? 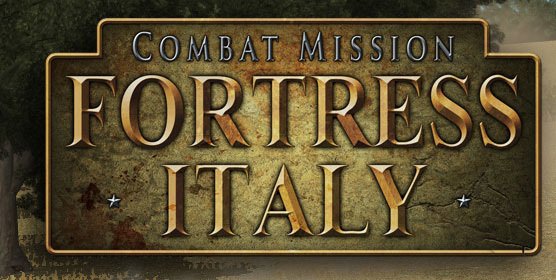 Fortress Italy is a strong entry in the Combat Mission series. It offers a highly detailed, down in the dirt depiction of one of the most important campaigns in WW2. The terrain you will fight for is difficult; where Normandy had its hedgerows, Italy has impossibly steep hills and ridge lines. The Italians bring a unique flavor to the mix, with their hodgepodge inventory of tanks and outdated infantry. The missions are well designed and challenging, though I wish there were more, since you can never get enough. If you like the base game, you will certainly want the Gustav Line expansion, which takes the fighting from Sicily to the Italian mainland. It adds a lot of content, including the ever popular Fallschirmjager units, and a campaign where you lead the Polish forces that faced them in and around Monte Cassino. Finally, Combat Mission games are greatly improved by having all of the Game Engine upgrades. While not entirely necessary, they add many of the wishlist features that players have been wanting for years. For me, the highlights for Upgrade 4 were the changes to infantry behavior. Your virtual grunts are now smart enough to peek around the corners of buildings, and now understand the importance of proper spacing when on the move. Previously, large groups of infantry on the move had a tendency to "spaghetti" when covering long distances. They would move more or less in several single file strands, which is a very bad idea when charging a potential machine gun nest. Overall, I give the game a big thumbs up for fans of the genre. It just does things that perhaps only one or two other series out there even approach doing. Fortress Italy, like the rest of the Combat Mission series, has a few rough edges and is showing some age, but it still has a lot of great, afternoon consuming experiences to share with players that take it on. I think at times the Combat Mission games are almost too detailed for their own good, creating little edge cases where the simulation breaks down and takes away from the fun. However, this may just be the price for doing things so well the rest of the time, and at such an ambitious level of detail. I feel like I could write an entire article on just that thought, but I will save it for another day. Finally, you don't have to take my word for any of this. Battlefront is one of the few game developers out there who continue to believe in the power of a quality demo being able to sell their game. Their demo for Fortress Italy contains four scenarios, including one from Gustav Line. Try it out, and see for yourself whether the game is for you. Excellent review, I have been playing CM for several years (CMBN and CBFI) and it's something that love and hates at times, the developer is one of them, updates that cost, not DLCs, but patches that come out several years late and so on. From time to time I get into really hard to then trow it away late when the amount of problems start to build up in the way the game handle somethings. As I say it's a love and hate thing.